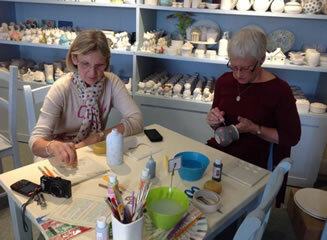 A hand painted ceramic is a lovely way of celebrating and recording special moments and events, for yourself or for loved ones, such as weddings, the birth of a baby, Baptisms, special birthdays and anniversaries. It's also a great way to record the milestones of your child - from baby footprints, toddler handprints and their first solo painting. And what better way to say thank you to someone than investing a little of your time, or of a group of people, to make them a personalised gift. Your item will be totally unique and hand made with love.